Anthropogenic global warming is a big call because it implies two things: that the world is warming and that humans are the cause. Measurements we make suggest that the world is warming. The last decade in Australia has been the warmest on record. Some of the hottest years, warmest summers, most number of consecutive hot days and record daily temperatures have happened just about everywhere. Add some record floods, devastating bushfires and damaging cyclones and it is as though warming is a given. And it is not just in Australia. There have been heatwaves in Europe, fires in California, drought in Russia, ice sheets shrinking in the Arctic and glaciers retreating in the Himalayas. It's everywhere. Even the Amazon is drying. It is definitely global. We know, thanks to the experiments by the British physicist John Tydall in the late 1850s, that there are gases in the atmosphere that absorb radiant energy to create the greenhouse effect.We also know that human activities have release millions of tons of these gases, especially CO2, as we have burnt fossil fuels and cleared land for agriculture. More gas, better greenhouse, more warming. So, of course, the latest warming phase is our fault. And we like the idea that we have that much control. It is also human nature to assume that if something breaks, then surely we can fix it. So strong is this feeling that we often try to fix things that are not broken. Convinced that we are the cause of the "broken" climate, we have taken this approach to the anthropogenic global warming issue and are scrambling to try and fix it. Statistically the answer is yes. There is a warming trend detectable from analyses of the measurements that we have to hand. The trend is real within the confines of the information. The problem is that direct measurements are very recent in climate change terms. They cover 120 years, not even a blink in the lifetime of the earth. Use of such a short run of data is like trying to accurately predict the size of the crowd at a rock concert from a quick glance over your shoulder from your seat in the second row. You get an idea but that's all. Indirect measurements of temperature (such as concentrations of carbon dioxide and changes in oxygen isotopes) that cover much longer times period of time make the trend less easy to detect. These numbers show that it can be warmer than it is today as well as colder and that trends can go in either direction. What these indirect tools are less good at is giving us the rate of change. The data are more coarse grained and show us long-term trend and periods when it was colder and warmer than today. What they don't say is how fast the transitions were between the cold and warm spells. 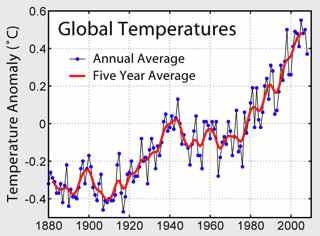 So the direct temperature measurements tell us that relative to the most recent averages, it is warming. Is anthropogenic global warming everywhere? It should be everywhere. There is nothing to suggest that the atmosphere is anything but egalitarian. Only warming is not happening everywhere. A more dynamic atmosphere and oceans does not affect all regional climates equally, nor does it make it hotter and drier everywhere. The Antarctic is on a cooling cycle. Climate models predict that it will warm in the Amazon and northern latitudes. 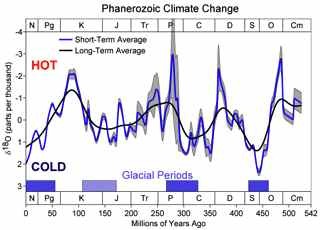 So is it really anthropogenic global warming? In the early 1800s the steam engine was invented. Unprecedented mechanical power that was, at first, stationary driving machinery such as looms that had previously relied on human or animal power. Soon that rotational force was applied to wheels and mechanical transport was transformed by trains. Once this force was harnessed to generate electricity the modern world was born. Easily the best fuel for these new machines and pawer plants was coal. It burnt hot, was relatively easy to dig out of the ground and familiar to us. And with the extra mechanical power it was possible to dig deeper, find oil and a whole new set of possibilities emerged. Before long we were burning a lot of fossil fuel, using it to subsidise agricultural production [fields were much easier to plough with a tractor] becoming prosperous, expanding in numbers and sending the industrial revolution fanning out across the globe. This numerical and industrial success meant an increase in the demand for power. And there was no need for any alternative power sources as coal, oil and gas were now abundant and available from many places around the world. People also made money exploiting these fuels. Emerging from the chimneys of the new factories and power stations was smoke. In amongst the soot and complex hydrocarbons was carbon dioxide, CO2. So much of it that the concentration in the atmosphere has risen from 280 ppmv to 399 ppmv since 1800. This 40% increase in a greenhouse gas correlates with the pattern of warming. So is it anthropogenic global warming? The IPCC says that it is "very likely"
Not certainly, because definitive proof of anthropogenic global warming remains elusive, but "very likely" in IPCC speak, means the climate scientists believe there is a 90% chance it was us. Wirl, F. (2004). International greenhouse gas emissions when global warming is a stochastic process. Applied Stochastic Models in Business and Industry, 20(2), 95–114. Zeebe, R. E. (2013). Time-dependent climate sensitivity and the legacy of anthropogenic greenhouse gas emissions. Proceedings of the National Academy of Sciences of the United States of America, 110(34), 13739–44. Zhao, X. (2011). Is Global Warming Mainly Due to Anthropogenic Greenhouse Gas Emissions? Energy Sources, Part A: Recovery, Utilization, and Environmental Effects. The links go to the websites of the publishers of this material. In some cases it is possible to find out more by entering the title of the paper into Google Scholar.